Whether you’re a weekend mechanic restoring that ’68 Chevy Nova or work in an auto repair shop, you’ll be doing some major engine work at some point or another. Unlike the days of Henry Ford, modern car engines are very difficult to work on without removing the entire engine, and the blocks are far too heavy to move without some assistance. Engine hoists as well as engine load levelers make the impossible quite easy. 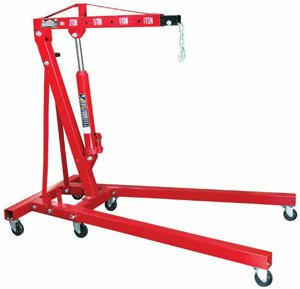 The best engine hoist for your garage should be able to handle whatever weight engine you’re working with along with the reach and boom height you need. A good hoist needs to be well built and stable when being used. With that much weight at the end of an arm, you should never have to worry about it tipping. Hooking up a load lever will make even the largest, off-center loads easy to straighten out and move around. What size engine hoist do I need? Can I rent an engine hoist? 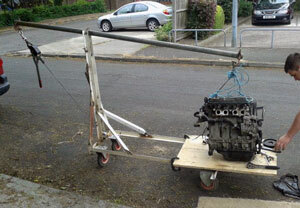 Can I build my own engine hoist? Why is an engine hoist called a cherry picker? 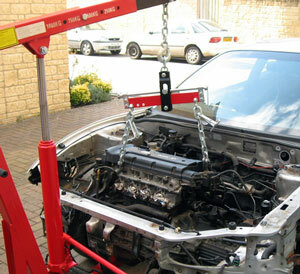 Engine hoists are useful additions to your garage or workshop, as they take the role of a portable crane. These three hoists all do an excellent job for both engine and general lifting tasks. This engine picker uses an eight ton hydraulic ram to provide reliable power to its boom. With a capacity of 1,000 pounds and 102 inch range when fully extended, the boom is able to handle 4,000 pounds at a 48 inch max height when closed. The frame moves on six fully rotating three-inch steel caster wheels for optimum mobility. The square tube legs use .125 inch thick steel, while the mass has 5/16 inch thick steel. 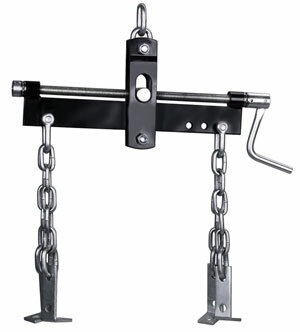 A 12 inch forged steel chain and 5/16 inch hook round out the features of this durable engine crane. 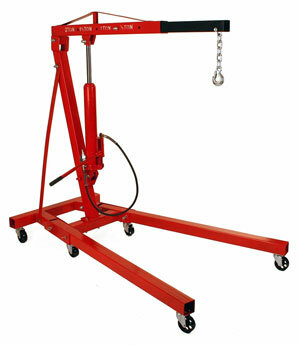 This hoist is perfect for the role is was designed to perform. It may be a little more limited on general lifting due to the shorter leg size, but that sacrifice makes it far easier to fit between the front wheels of your car. Even on a full load, the caster wheels roll smoothly, making it a cinch to transport your engine block from one spot to another. Shipping quality has been the biggest sticking point with this engine crane. The nuts and bolts aren’t individually packaged, causing them to spill out and get lost easily. The hydraulics can become damaged as well, resulting in fluid soaking into the boxes. Due to its weight, the product is shipped in two separate boxes to allow it to be shipped via UPS (instead of a freight company). While allowing for cheaper (free) shipping, heavyweight items such as this are more prone to shipping damage. While most buyers will not experience any damage or missing parts from shipping, it’s worth mentioning. This folding engine hoist has a heavy duty 8-ton long ram for excellent weight capacity. Its four-hole position boom can lift up to 4,000 pounds between 1 and 91 inches from the ground (note that some online product pages list the maximum lift height as 78.75″). The frame folds for easy storage, while the six castor wheels allow this hoist to be positioned accurately and easily moved around the work area at full capacity. One of the advantages to this hoist is its ability to fold the legs vertically at the pull of a pin. This makes the transition to and from storage easy, and the hoist fits well in a vertical corner when not in use. Users have also noted the metal is much thicker than comparable models, making it heavier, but far more durable. Customers had similar issues with the packaging of this hoist to the previous one, having to fish for nuts and bolts that were packaged loose. The box often arrives battered and the hoist itself may be damaged. A few have also noted alignment problems during assembly, although this appears to be a defect issue and not a common problem. Our second pick from Dragway tools is another heavy duty 4,000 pound crane. As with the previous model, this cherry picker has six 3-inch caster wheels, a boom range of 0 to 102 inches when extended and 0 to 48 inches closed, and a thick steel frame. The biggest difference with the LD-1001 is that it uses a hand pump or air power in conjunction with the hydraulics, with the lift mechanism functioning at the push of a button. This is an excellent picker with a very sturdy design and high max lift. The air pumping mechanism works well, albeit a little slower than a non-air model. Overall, it is an excellent choice for any home garage or workspace. Shipping is again an issue for some. Some owners have received their package slightly banged up upon arrival. Thankfully, whenever the crane arrives intact, its owners can find no other faults with it. Heavy loads require balance, and no hoist should be used to lift an engine without a leveler equipped. These two levelers provide both quality and safety at a reasonable cost. Capable of lifting up to 1,500 pounds, this leveler provides some useful features when attached to any A-frame engine hoist. The horizontal tilt can be adjusted, making it easier to carry off-center loads. The angle can also be adjusted to make positioning the load easier. 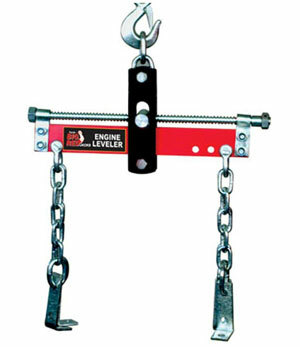 Owners of this small leveler have used it on a wide range of engines. The ability to adjust balance makes it easy to move an engine after adding or removing parts without having to reposition the chains. It also carries weight effortlessly despite its size. This is a very small leveler, measuring only 18 inches wide. The chain might have to be lengthened for some big block engines. You may also have difficulty with moving some larger machinery. 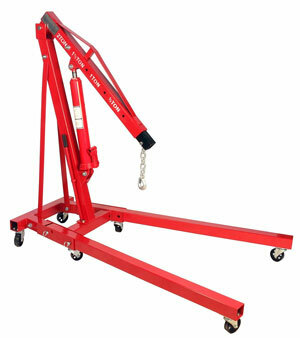 This engine hoist leveler can handle any engine with ease. It can carry up to 1,500 pounds on its 14-inch chains, and the support brackets are designed to easily attach to the engine. Made of high-quality steel, the T32100 is designed to make changing the center of gravity a cinch so you won’t have to constantly adjust the payload. For the cost and size, the T32100 has proven itself time and again. Owners have used it to lift engines of all size, although the chains may need to be lengthened for the largest engines. It has also fared well in busy garages where it sees frequent use. Most complaints about this leveler revolve around the adjustment knob. Made of plastic instead of metal, users are concerned it may not be strong enough for heavy use, although are no known reports of the knob breaking. 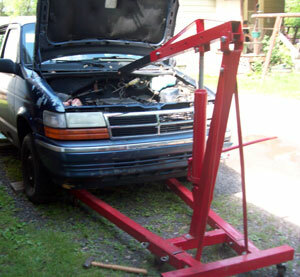 Purchasing an engine hoist can be a major step for many rookie mechanics. These large pieces of equipment have a lot of potential beyond just shifting engines, but where do you start? Is the investment worth it, or are there cheaper alternatives? There are three size factors to consider. The first is tonnage. Hoists can have a max ton rating of one or two. Generally, owning a two-ton (4,000 pound) hoist will be a better option, since it can carry more. The second factor is length. Most cherry pickers will have a similar length, but be wary or shorter hoists, as they may not be able to reach far enough to safely lift your engine. The third size factor is lift range. This dictates how far off the ground the hoist can lift your engine. The low figure for the boom height isn’t as important, but the ceiling will dictate whether or not you can clear an engine block over the hood of taller trucks. Most hoists can lift a little over six feet (72 inches), while a few others can achieve 8.5 feet (102 inches). This latter also allows for a wider range of crane operations beyond engine hoisting. It’s possible to rent a hoist when you only plan to use it once. Rental fees tend to be a fraction of the unit’s cost, making it much easier to rent for a few days than to purchase one outright. However, it can often be a better investment to purchase a new hoist so you don’t have to worry about any time limits on usage or figuring out how to transport it home. While such a thing is not unheard of, building a hoist on your own can be dangerous. These hoists carry a large amount of weight, and you will sometimes be underneath that weight as in the case of laying on a creeper. Log hoists (using a beam and a log for leverage) have been used to slightly raise an engine, but cannot move the engine horizontally and could slip. Meanwhile, any errors in welding a metal hoist will result in an accident that may cause injury and costly damage to your engine. In 1944, Jay Eitel became frustrated at how time-consuming it was to keep repositioning the ladder while picking cherries. As a result, he created a machine which required two people to operate. One would raise and lower the boom, while the other would be in a basket at the end of the boom, picking cherries. John L. Grove later took the design and made it self-propelled so a single user could operate it. Firefighters began using the cherry picker design in 1958, and it expanded to accommodate a multitude of uses in the decades to follow. Engine hoists are part of this family of hydraulic booms, although the basket has been replaced by a hook and chain design. Thus they are often referred to as “cherry pickers” in honor of the boom family’s humble origins.